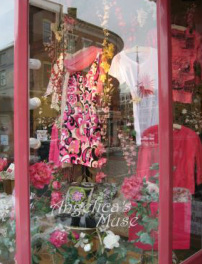 The first thing that people notice when they walk through the door of Angelica’s Muse are the wonderful fabrics in a kaleidoscope of colors and textures. Not surprising since this store was founded in 1996 by a textile lover and collector with a focus on all things beautiful and unique. Our customers always feel assured that the hard work of curating from the vast world of fashion has already been done for them. This means that you can relax and enjoy your shopping experience. And what a special experience that is! All of the lovely ladies that work here have you and your wardrobe needs in mind. We know just how to find the right thing to help you look and feel your radiant best. At Angelica’s, we feel that no “body” should feel excluded so you can count on finding your size here no matter what it is. We know our customers and what they are looking for and we keep this in mind when we go on our buying trips. Besides our great clothes for all aspects of your life, people depend on us for truly finding the unique and artistic. We carry a large selection of carefully handpicked American Made art-to-wear. And if you are a scarf lover then you’ve found your nirvana! With a background in the healing arts, Heidi never expected to find herself in a long term career in retail (therapy), yet she has been a part of Angelica's Muse since the very beginning. In this realm, her natural artistic sense, love of all things beautiful and great passion for people have proven to be a delightful combination for contentment and success. The results of which have proven to be a win-win for herself and the many loyal customers that have come to consider her their personal shopper. Audrey is another one of the artists that we are fortunate to have among the ranks at Angelica's Muse. Audrey says that being in the store is like being in her studio, and it shows from her beautiful work on our displays. She feels the inspiration for her work here comes easily, being surrounded by the gorgeous fabrics, and endless colors and textures that we have from our many talented designers. Audrey loves meeting and greeting and helping people; and our customers enjoy reaping the benefits of her process as she always seem to put together just the right outfit with ease. By the way, she's also known for "thinking outside of the box" and helping customers to make the step outside of their normal comfort zone dressing - but only when they're ready! After working on big ships as a Merchant Mariner for 14 years Deb decided she needed a complete change of course and personal direction. Textiles has always been her passion and she has spent a lot of happy time doing fiber arts as well as collecting. Creating Angelica's Muse seemed like a natural fit for her.